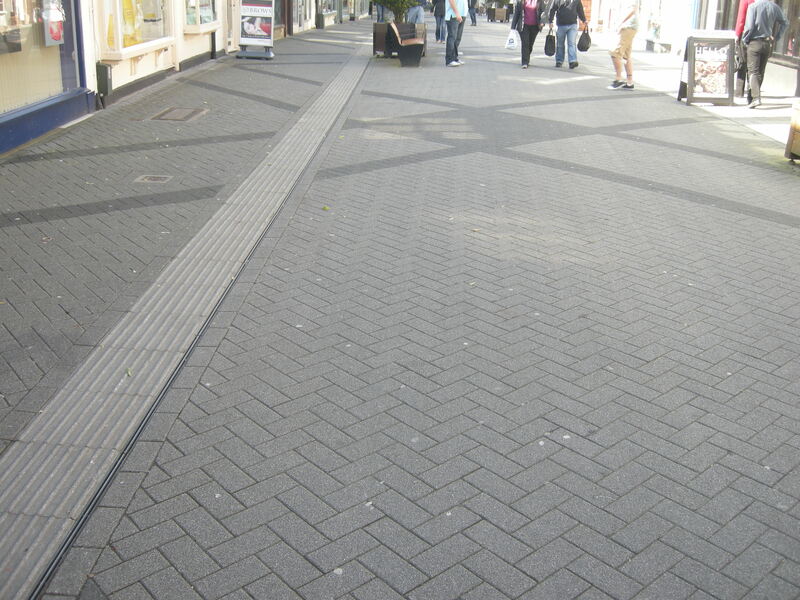 By way of a follow-up to last week’s post about Zebra crossings, and how we manage to mess them up, I thought I’d address a similar common design feature of our streets that is hopelessly confusing – double (and single) yellow lines. And single and double red lines. And double and single yellow kerb markings. Yes, when it comes to road markings, we’ve managed to create a welter of different ways of permitting waiting, loading and stopping (each subtly different), at different times. 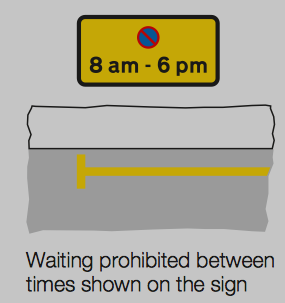 The humble single yellow line prohibits waiting, at certain times of the day. 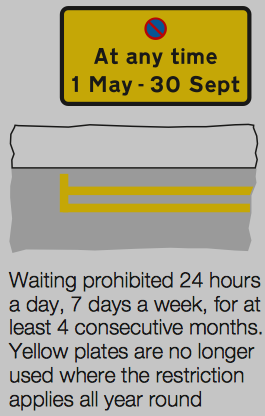 The double yellow prohibits waiting at all times, when that period is at least four consecutive months. 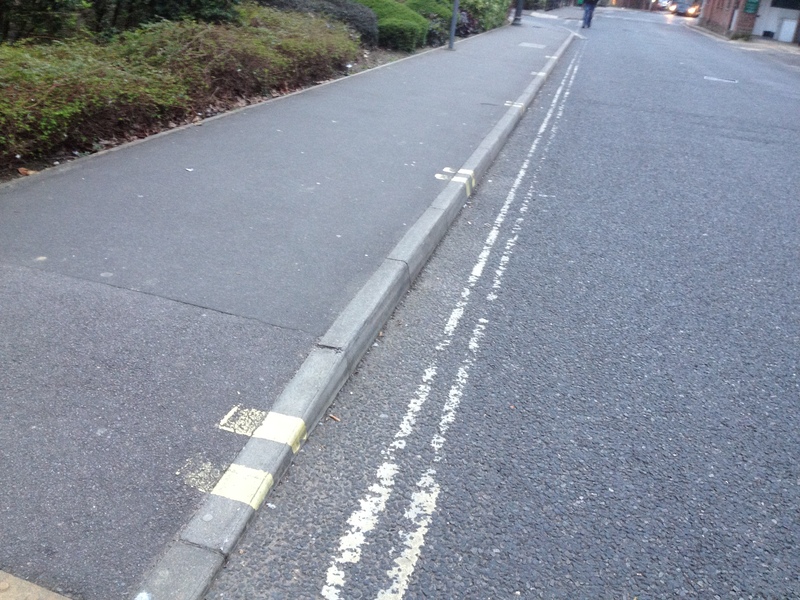 These double yellow markings no longer need to accompanied by the yellow sign if there is no period of restriction. So feel free to modify the signs, when you see them. Drivers are permitted to stop to pick up, or set down, passengers on these lines, or to load and unload (where it is not prohibited) – but they are not allowed to ‘wait’. Simple enough so far, but then it gets more complicated. Holders of disabled blue badges can park (‘wait’) for up to three hours on double yellows, providing they are not causing an obstruction. 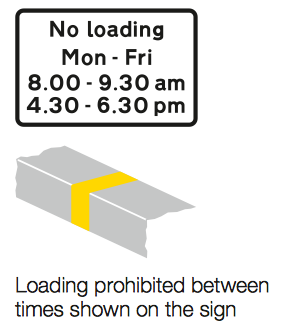 Then there are specific loading restrictions that rule out loading on single and double yellow lines. These are marked on the kerb. The single yellow line prohibits loading (either on a single or double yellow line) at the times on accompanying sign. 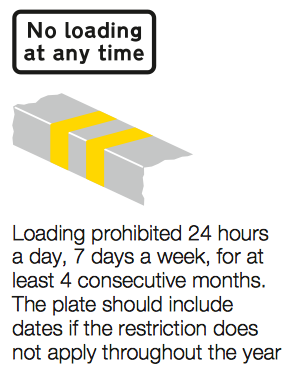 The double yellow kerb marking prohibits loading on a double yellow at any time. 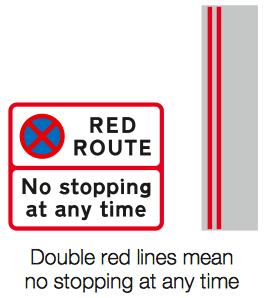 And double red lines, prohibiting stopping at any time. Phew! And all this without even touching on the fact that cycle lanes will require forms these additional markings within them, to prevent them being obstructed. And of course any Dutch city. So there must be a simpler way! 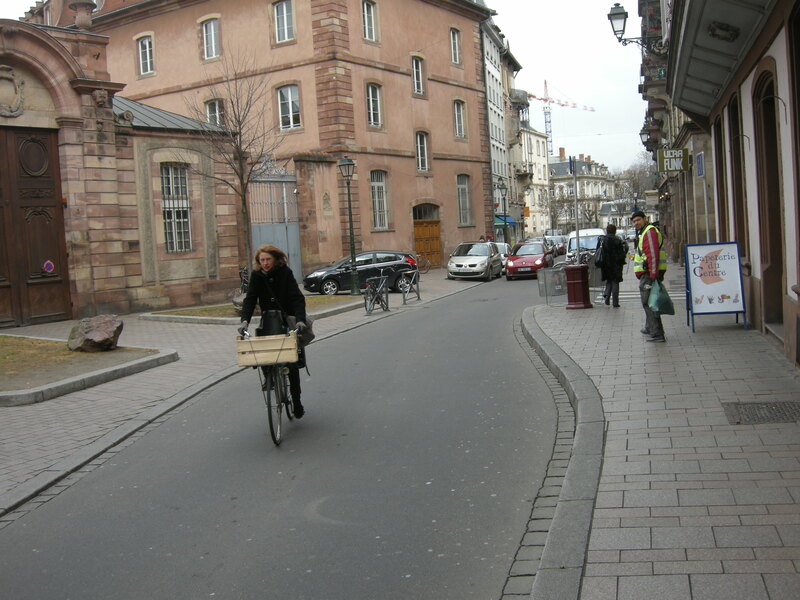 The principle in these European cities seems be that, rather than using an excess of signs and paint markings to show what you can’t do, it is easier just to mark out only the places where you can park, and leave the rest of the street unmarked. Can we do this already in the UK? Perhaps a traffic engineer could supply a definitive answer, but there does seem to be a precedent. ‘Shared space’ streets (to use the catch-all term) are increasingly common, and usually free of unsightly double yellows. These streets come with signs, on entry, prohibiting waiting, except in marked bays. 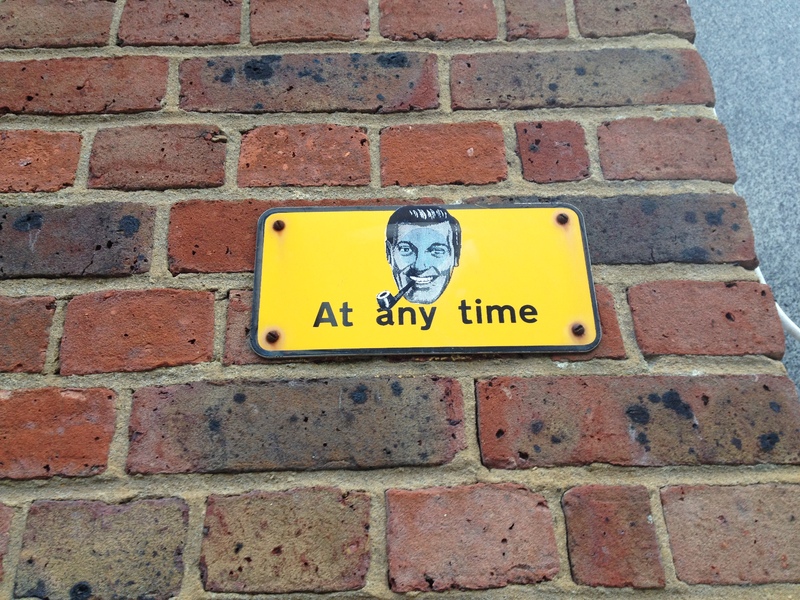 Here’s a similar sign, on entry to New Road in Brighton, which again doesn’t have any painted markings. You can’t park anywhere here, except in the marked bays. 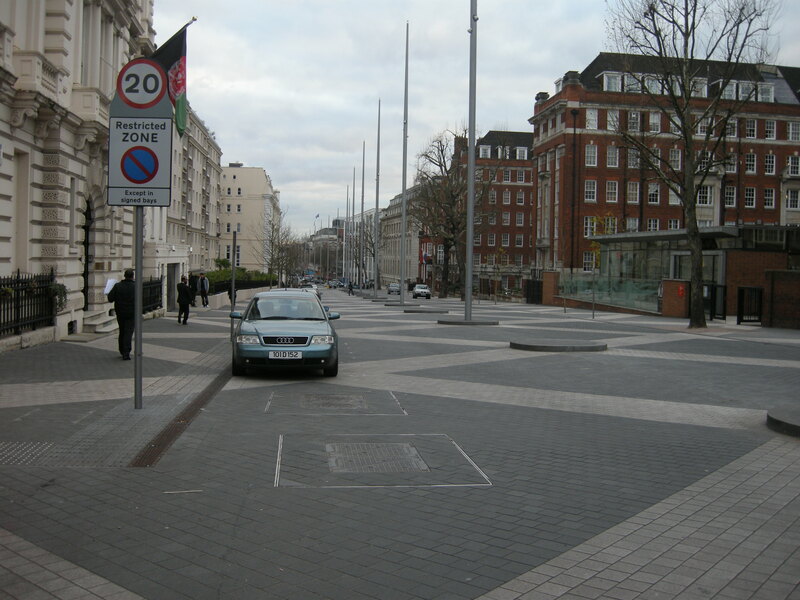 And of course Exhibition Road – which I have criticised for other reasons – also sets a useful precedent, in this regard. No need for double yellows, when you have this sign on entry. No waiting – except in signed bays. Could this principle be extended to our town or city centres as a whole? 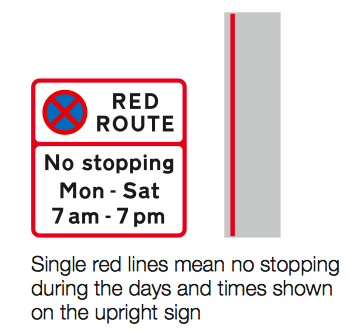 That is – simply using ‘restricted zone’ signs on all entry routes, prohibiting any waiting, except in marked bays? That would allow us to remove all the unsightly yellow markings and clutter from our streets. It would also simplify the way we mark up roads for cycling. I don’t see why not, given that this method is already being employed. Just like the humble zebra crossing, we seem to have over-legislated our way into an awful way of doing things – could we find a sensible way out? I think part of the problem “over here” is that every motorist has it ingrained in them it’s their God given right to just drive to town and leave their car where they please for free. An attitude that I don’t think is mirrored on the continent as they actually engineer the car OUT of the town or city centre and encourage more person-scale transport in these areas. it really is mind boggling when you lay it all out as above the multitude of regulations and amount of overlap between regulations. Of course it could be, but as usual with this country ‘I wouldn’t start from here if I were you’. 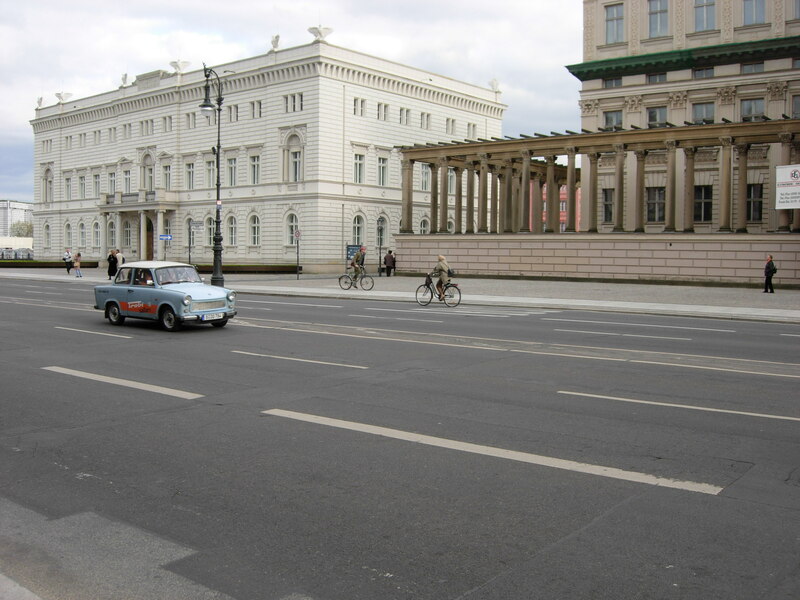 I genuinely don’t understand why politicians and people in general think our roads evolved when in fact they look as they do because people made them like this. There’s absolutely no reason why things cannot be simplified, except that all-too-familiar lack of political will. Yep, ban all on-street parking unless it’s in an actual parking bay. Simple. The UK is one big carpark of abandoned vehicles, usually at least two wheels on the pavement. There’s then marked bays (which have no yellow or red lines) that have have their own incredibly convoluted restrictions, and you have to read all the signs (where they exist) and understand it all before you can park up. (The example below is a geniune attempt by Islington council to manage parking within walking distance of a football stadium). Hmmm – thinking of the small town where I live, I think there are probably more places where you CAN park, then ones where you can’t, albeit that there are several places where it would be preferable if parking was also prohibited for one reason or another. So I think we would end up with more paint rather than less. In any case, there is widespread flouting of what few double yellow lines we actually have, so the screw-you attitude adopted by such motorists would, I suspect, become more evident if roadsides were simply not marked at all. A useful idea as the complexity of the system and the legal requirement for all the signs and lines to be in place and visible to motorists give rise to an enormous number of appeals, many of them successful, against parking fines. Take it all electronic. If you have a car, you can probably afford a smartphone. This also allows much more dynamic management of parking, e.g. term time vs non-term time, special events, dynamic pricing, etc. You then only need tiny amounts of paint or other markings to delimit parking bays or areas. Seconded! Why should anyone be *forced* to have a smartphone? That’s the kind of thinking that has led to getting rid of all the manned tills in supermarkets and other large shops (Boots at the Eastgate Centre in Bristol – I’m looking at you!) and putting in “self service” tills instead. I am 99% confident that a manufacturer of road paint has friends/family in the DfT. 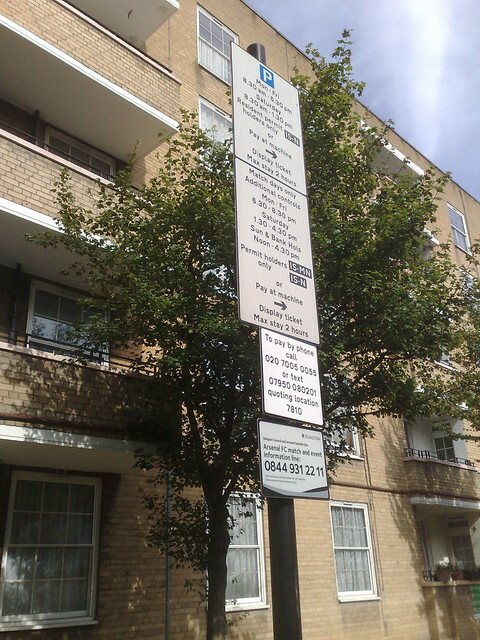 While you’re simplifying the ridiculously arcane UK regulations, how about having a go at bus lanes: allowed for buses and cycles only, at all times, no parking at any time. Round here the second the restrictions are lifted all bus lanes turn into car parks (I’ve no idea where all those cars are hiding at other times). many’s the time I have left other drivers confused as I confidently drive down certain bus-lanes in Gloucester at times when they aren’t in force. I’ve come to the conclusion that most drivers just see bus lane and are conditioned to stay out of it full stop… never bothering to look for the qualifying times sign at all. 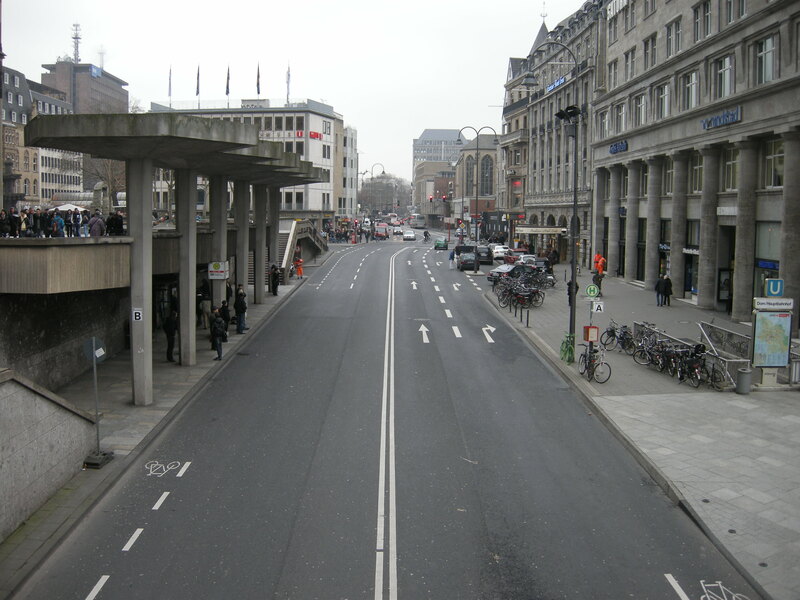 I generally stay out of anything looking like a bus lane if I’m unfamiliar with the area just to be on the safe side. IMHO, any “sometimes-you-can/sometimes-you-can’t” facility should have a very clear indicator of the current status (eg traffic lights). Or just make the facility permanent in operation. Wordy signs detailing periods of operation are really difficult to assimilate at the same time as trying to navigate unfamiliar areas. Unless, of course, you have a blue badge, in which case; pretty much park where you like. My daughter had a fight on her hands (successfully won it) when she parked in a designated bay but there were roadworks signs up stating the bay was closed. However, the roadworks signs were only actually active for Monday through Friday. Weekends they weren’t in force even though they were left on display. I’d say blue badge should not permit parking on double yellows either. It’s the same kind of thinking that had Pickles suggesting a 15 minutes grace period on double-yellows: like there isn’t really a reason for them to be there. 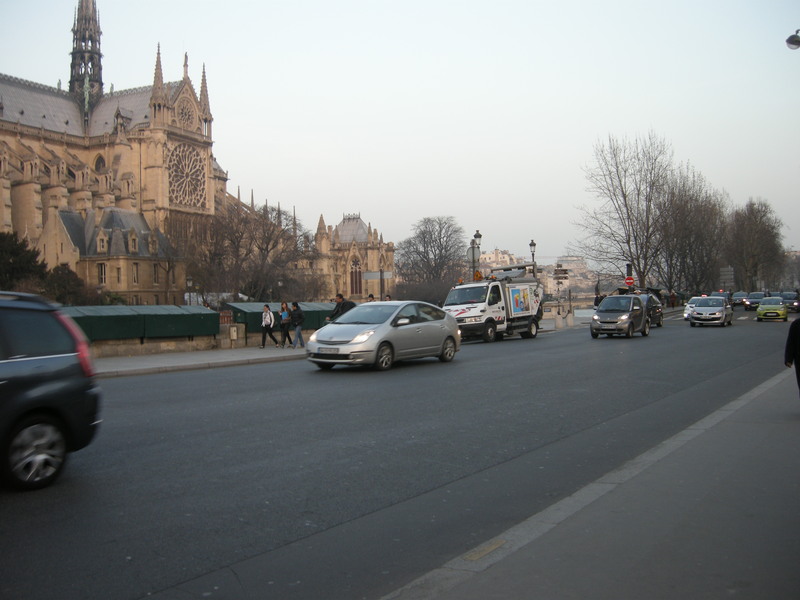 Well, there is a reason: parking impairs traffic flow, causes an obstruction, or dangerously impairs visibility. Why is there this get-out? Disabled parking is an important issue, but it should be situated where it is safe and reasonable to do so. It contributes to the relaxed attitude many drivers have to double-yellows. I agree – when cycling on the road it doesn’t matter to me if the vehicle forcing me into the centre of the road is parked legally or not. The danger for cyclists is the same. More needs to be done to ensure there is plentiful disabled parking in town centres, in a place that is safe for everyone. It’s just another part of the complete restructuring of our roads that is needed to make where we live fit for people to live in. Where does this fit in the hierarchy? 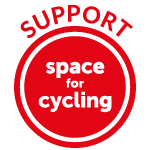 Otherwise, given the thickness of the layer of paint that seems to be in favour, the same goes for painted bicycle symbols: there’s a noticeable bump in riding over recently repainted ones round here. Mind you, a couple of extra coats on the cycle lane boundary lines and armadillos won’t be necessary. Watch out for the smart phone or other “solutions” to making parking more “efficient”. It will be a way of cramming more cars in. This post is very sensible, which is why the ideas in it probably won’t get very far. the DfT bureaucracy of signing is notoriously complex and difficult to change. 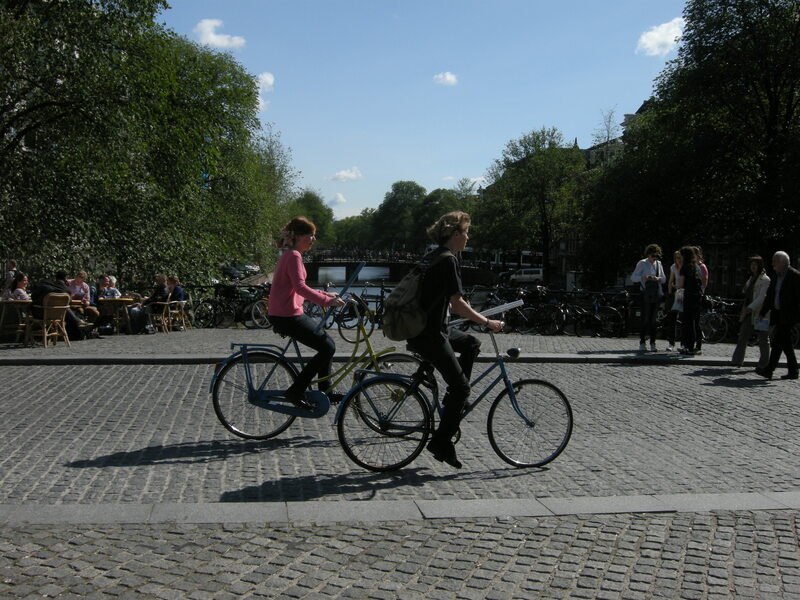 It took us YEARS to get the exemptions to No Entry for cycles changed, and that was very simple. 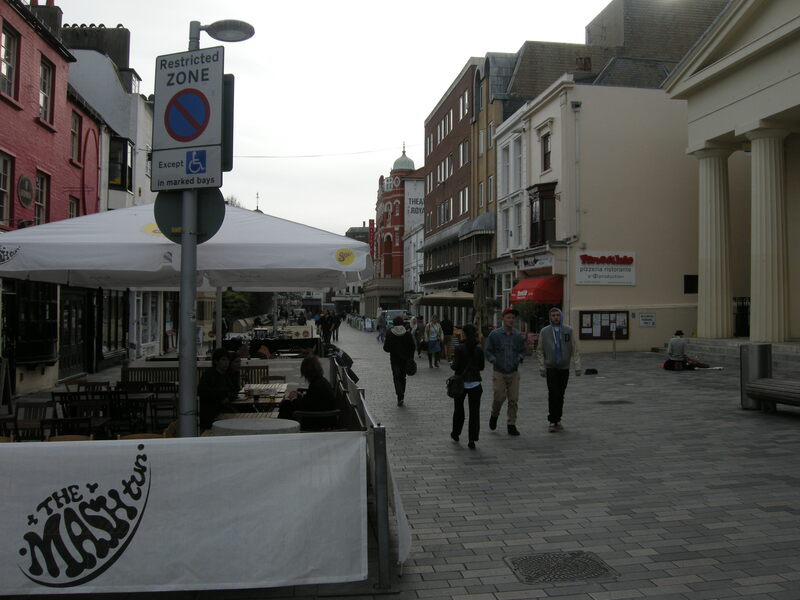 When the town centre was redeveloped with lots of expensive stone slabs, we set up a disc parking zone (free but limited time) on the basis that it was only permitted to park in marked bays. To avoid having to paint yellow lines over the stone. Although that complies with the marking requirements, the sheriff decided he would not be comfortable with parking fines being made as “it was not clear enough”. And so the yellow lines had to go down too. UK drivers seem to believe they have the right to park wherever they please and that traffic wardens who try to keep our cluttered streets clear so traffic can pass somehow end up as the bad guys. Our streets are absolutely filled with road markings and signs to tell drivers how to behave because without them they really would just do as they please. The emphasis shown in Europe is correct. People should park where they are told and the absence of a sign does not allow you to park there. Even our convoluted method does not work as drivers often ignore all signs anyway. On my walk into work I see entire streets where half the pavement is block because cars have 2 wheels parked on the kerb. 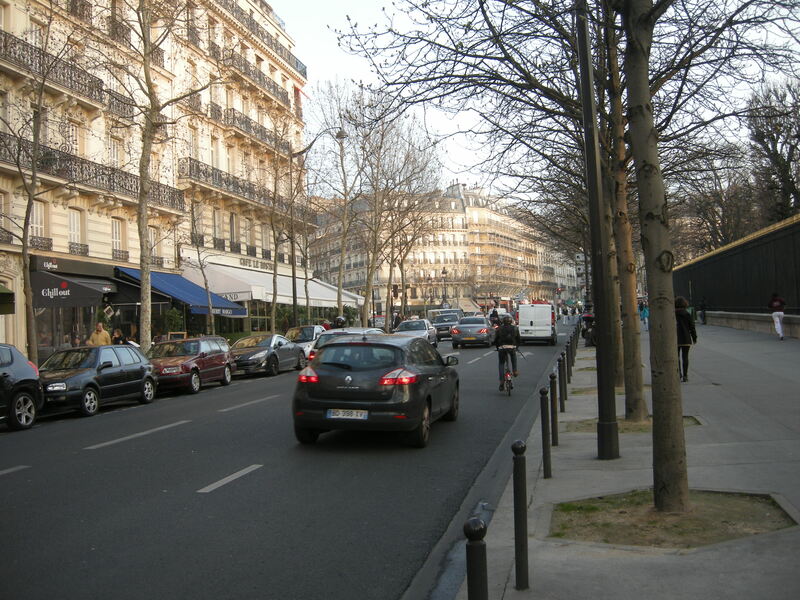 Cars parked in bike lanes, cars parked on double yellow lines, cars sitting at bus stops or in bus lanes, cars parking on junctions or near zebra crossings. I see little sign that motorists pay any attention to parking rules at all. They will park anywhere – dangerously close to junctions, on zig-zags outside the schools their own children attend, in mandatory cycle lanes, right across the dropped kerb of a light-controlled pedestrian crossing (half on the pavement), in ASLs, on single and double yellows, on the pavement, on patches of wasteground…in any space in which a car can physically be made to fit. Red routes seem to be taken more seriously than yellow lines, but they are full of those peculiar ‘loading bays’ (in which I have yet to see any actual ‘loading’ going on). Traffic wardens appear to have vanished entirely while the police don’t regard parking as part of their remit (I’ve seen them many times standing right next to illegally parked cars while they deal instead with such pressing issues as ‘street drinking’ or ‘youths standing around in a group’). The only time parking rules seem to be enforced is when it involves private land and aggressive clamping as a means of revenue-raising for the landowner. In those cases the (Denver) boot appears to be on the other foot, and sometimes it seems to operate almost as a deliberate trap for the motorist. Where can one find clear definitions of terms like “loading” or “obstruction”? If I’m dropping passengers off is that “unloading”? What if I get out of the car and put a crisp wrapper in a bin? Then is it “unloading” rather than “waiting”? This seems like a ridiculous distinction to make, and tbh as a cyclist I’d rather have one stationary car in a location than cars coming and going all the time. Similarly, any car stopped by the kerb for any reason would obstruct my passage and force me to pull around it on my bike, so any car parked by a disabled driver is an “obstruction” in that sense. Of course in practice drivers just stop where they like. As I’ve mentioned before on here, in Manchester parking enforcement (or the lack of) is the responsibility of the council for some reason, and drivers officially get 5 minutes to move from double yellows, with no penalty, so they know they can return another time with impunity. He stopped for a few seconds to read the sign, discovered he couldn’t park at that time, drove off and parked elsewhere yet they still ticketed him. The best place find detailed (if not always clear) descriptions of waiting and loading restrictions is in the traffic regulation orders that impose them. 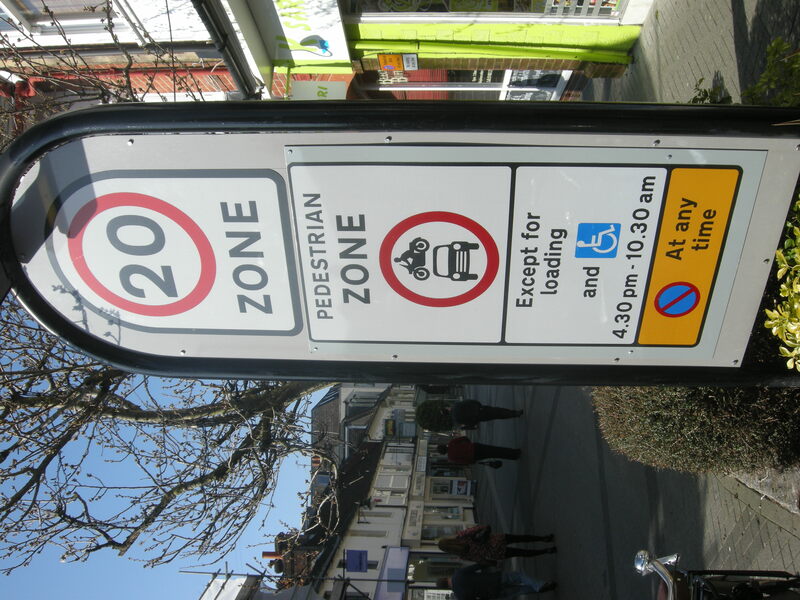 In Cambridge (where I happen to live), that was the The City of Cambridge (Civil Enforcement Area) (Waiting Restrictions and Street Parking Places) Order 2008 (Amendment No. 37) Order 2011 the last time I checked. Where you live, the rules might be subtly different. Thanks for the reply. Although it would suggest that terms like “waiting” or “loading” might mean something different in your street to what they mean in my street, and therefore your double-yellows mean something different to mine? Or, since TROs often only apply to sections of road, the markings could mean something different at one end of a road to what they mean at the other end? How can we possibly work on that basis? Surely a double-yellow-line should mean *exactly* the same thing from one town to another! I am more and more horrified to see beautiful little villages ruined by bright double yellow lines on its streets. I’d rather see a few tin cans tossed out of a car, at least this is the kind of street clutter I can pick up and place in a bin. The U.K. Local Government cannot help itself to over-regulate we ignorant peasants who dare to drive a car. Where I have a house in France there is nothing like this to be seen, even in the towns. I think you’ll find sympathy here for your complaints about excess paint – that is the focus of the article. But not so much when it comes to “pity the poor drivers”. Cars littering our roads are what have caused this problem in the first place (as well as many many others). They are necessary and useful tools, but that doesn’t justify the sense of entitlement often demonstrated by drivers. As the article says, if cars were, by default, not allowed to park on unmarked roads, only in marked spaces, it would make life clearer and cleaner. But I’m not sure all the drivers are going to like it.